Alpine Ski Racing for kids, teens…. Welcome to the new RACE ROOM – where we’ll get you everything we can on alpine ski racing programs, gear, ski race camps – even some tips to make you a faster ski racer AND have more fun! 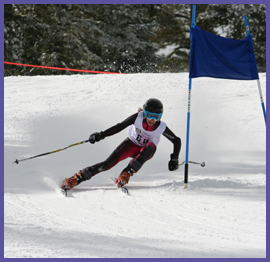 When to start your child ski racing. Ski Race Camps… What to know. Thanksgiving Race Camps… Do the Copper Gobble. KIDZSTORE: Shop race apparel, equipment and accessories. --- Race/speed Suits: G.S. and speed suits. Shave those seconds! Complete training and get ready for the competition in Spyder. Taped critical seams prohibit water penetration. ; Removable elasticized suspenders. ; Full front leg zippers. ; Custom embossed taffeta lining. ; Cargo pocket. ; Custom print design. ; XT 5,000mm Coating creates a honeycomb structure of micro-pores that keeps moisture out but also allows the fabric to breath. ; Spylon water repellent finish repels moisture and protects against water and oil-based stains. ; Thinsulate is constructed to trap insulating air, reflect radiant body heat and deliver exceptional warmth.